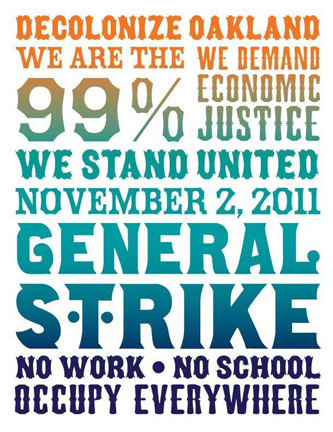 This Wednesday, November 2 in Oakland California there will be the first mass general strike in the Occupy Wall Street movement. Thousands are expected to be converging on Oscar Grant/Frank Ogawa Plaza to protest the current system that has allowed the massive disparity in wealth across the world. Su pelangueros plan to be there to protest and contribute. We’ll be playing our favorite take-to-the streets, power-to-the-people, el-pueblo-unido inspired records LIVE, just blocks away from the heart of the protests at All Day Play (Youth Radio studios). Our good friend DJ Smokestack will be hosting us on his weekly live podcast radio show Accepted Eclectic at 6 PM, (time has been moved up to 5 or 5:30PM) PST. Hopefully many of you will be able to participate directly, but for those who can’t—be sure to tune in online as we join the sounds of La Pelanga with the chorus of the 99%.